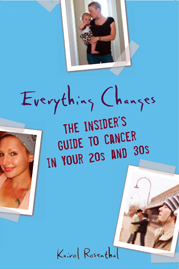 Everything Changes – The Guide to Young Adult Cancer » Want to Write About Your Cancer Experience? Want to Write About Your Cancer Experience? One of the great things about being an author is all the emails I get from other aspiring writings who want to learn more about how to get published. They want to know about the craft of writing, the process of becoming an author, and how to succeed in the literary marketplace. When I began writing my book Everything Changes, I knew little about this field. Over the years, I schooled myself through trial and error, conducting tons of research about writing and publishing, and connecting with professionals in the field. I’d like to pass along some of my knowledge to other writers who are interested in the subject of living young with cancer. I’m starting a new project called ‘Intern with An Author’ and I’m seeking my first set of interns now. Interns will write blog posts, receive editorial feedback, and learn some of the ropes of the writing, publishing, and PR industry. I’m particularly interested in working with writers who have dealt with parenting and cancer, young adult caregiving, and thyroid cancer. But there’s room for other writers as well, even if you don’t fit into one of these categories. For detailed information about the project, shoot me an email: kairolr at gmail dot com. Can’t wait to hear from you! Please let me know what you think. I am an aspiring writer. Whoever gets this gig will be one lucky writer who will be learning from the best! Shucks Lori, you make me blush. And Nadia, yes, that is no problem at all that you already have your own blog. I’m going to email you an info sheet including application information. I just checked out your blog too and found very fascinating your post about cancer and bankruptcy. Nadia, LOVE your Blue Butterfly blog, I’ve added it to my “Favorites”.. as a Stage IV Metastic Thyroid Cancer with left vocal chord paralysis survivor and two recurrences since my first diagnosis, I can totally relate to your blog..
Nadia – I also found your blog very interesting. Especially about the lack of advocacy and/or funding re: thyroid cancer. I agree it is often a “forgotten” cancer, even in e-mail chains about “lighting a candle” for cancer pts, in the American Cancer Society walks, etc. And it being the #1 cancer in young women – who are in the prime of our lives so to speak – is so important too. I would be very interested in this opportunity. I have such an interest in sharing my experience and helping others realize they are not alone. “Every changes” was my “chemo Bible” I was diagnosed with NHL at 26. At the time my oldest daughter was 3 and I had 1 year old twins as well. Would love this opportunity! If I’m not too late to the game, I’d love a chance at this too. I’m still in the throws of thyroid cancer treatment and dealing with the toll it’s taking on my family. I have a blog (click on my name to go there) if anybody is interested. I’m in the midst of thyroid cancer treatment as well (had a TT a little over a week ago) and am working on compiling my journey so far. If you could send me more information that would be great. If you each shoot me an email (address listed in contact section) I will add your name to the list of people wanting an update when I have a next opening for interns. I just started with a new batch of interns, so it might be a little while. But these are rotating positions so there will be more opportunities ahead. Until then, keep on writing and be well. PS – Julie, so glad that Everything Changes became your bible! Aimee – Good luck on your TT recovery. Take it easy. You know I’m your girl Kairol. I’ve been writing Baldies’ Blog for years and am only now foraying into books. My first children’s book, Z and the Cancer Meanie, is up for sale TODAY written with the questions my X has asked along the way. I also have a trilogy in the works with book one “Real Women Are Bald: You Cancervive” needing a final editing and book two “Adventures in Cancerland: Living Health History” well on its way. I do need guidance, mostly an agent and a published. Mostly, sounds like fun. Where do we “middles” go? I am not a young adult and not elderly. I just found out this week I have thyroid cancer. Is there another blog? I’m 50, not 30 or 80. I am so sorry to hear about your recent diagnosis. I think a great place for you to receive support is through The Thyroid Cancer Survivors Association. Their members tend to lean older than young adult, but I still know many who are not pushing the walker yet. Their website is http://thyca.org/ Please feel free to shoot me an email (address is above) if I can be of any help to you. This is a hard road. Hang in there.